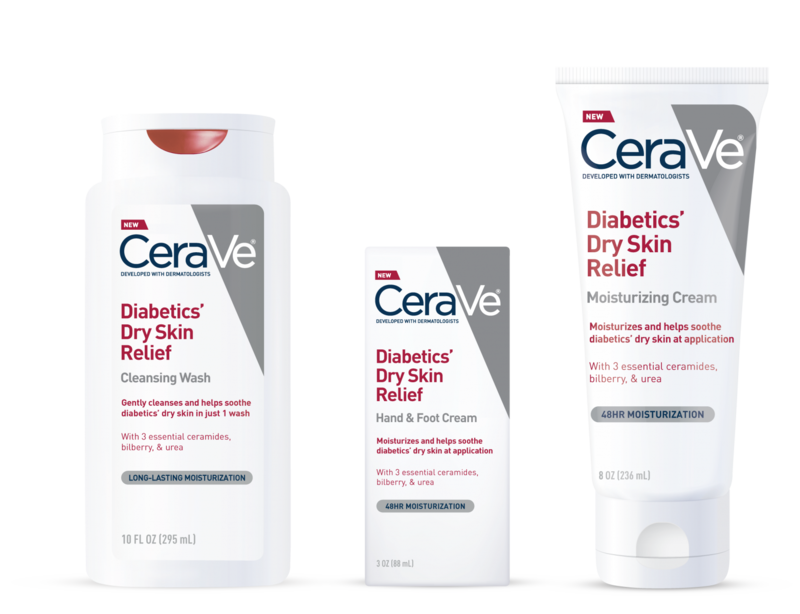 Big drugstore brand CeraVe has launched a new line of skin care products designed to help people with diabetes maintain healthy skin. The line includes a general moisturizing cream, foot and hand cream, and a body wash. Particularly as people with diabetes are more likely to have dry skin, which can lead to minor injuries that could get infected, keeping skin moisturized is one of the easiest ways to prevent skin problems. The CeraVe diabetes line is relatively affordable, with comparable prices to other CeraVe moisturizing and cleansing products as well as other drugstore brands like Cetaphil and Neutrogena. The products are available in the United States at Target, Walgreens, and on Amazon. In particular, taking care of your feet can be helpful in preventing more painful and dangerous problems such as ulcers. Particularly for people who have neuropathy, or nerve damage, it’s important to take preventive measures like keeping skin from drying out and cracking. For this reason, the CeraVe diabetes care line has a special hand and foot cream that is much thicker and moisturizing than the general body cream. Click here for more tips on how to take care of your feet. CeraVe products usually have three essential ceramides (ceramides 1, 3, 6-II), which are a natural substance that help form the skin’s barrier and help the skin hold on to moisture. For their diabetes line, they’ve also added urea and bilberry, which has anti-inflammatory effects and can help reduce skin bruising. That said, we have not compared this product to other diabetes-oriented creams and lotions that sell at comparable prices at stores like Walgreens, CVS, and Target. Other popular brands that have diabetes lines include Aveeno, Eucerin, Gold Bond, O’Keeffe’s, and more. While creams and lotions targeted towards people with diabetes are certainly not new, it’s great to see more options for people at drugstores.